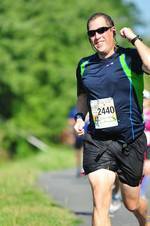 This race is an experience everyone should have at least once in their lifetime. You are running on one of the runways at Dulles International Airport (IAD) while the rest of the airport is still operational. You get to see planes taxiing, taking off, and landing on other runways while running the entire length of runway 1R and back. Parking is provided for free at the Udvar-Hazy Air & Space Museum in Chantilly. Make sure to get there with plenty of time since you are running on an active airport you will need to go through security screening. For runners this means being scanned with a handheld wand but it still takes time to get through security, through the museum and out to the start line. Spectators are allowed but only at the start/finish line not along the runway itself. 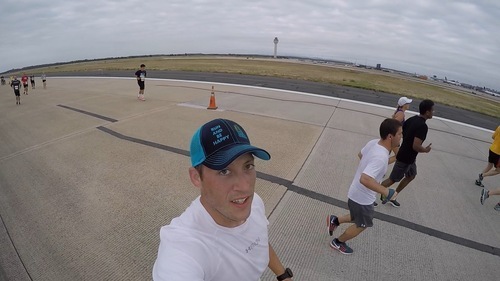 Since the race is on a runway it is the flattest course you will ever encounter. In fact, both time I've run it I've set PRs for the distance: 1:01:09 in 2015 and this year 58:14. The race is limited to 2,500 runners total for the 5k & 10k.